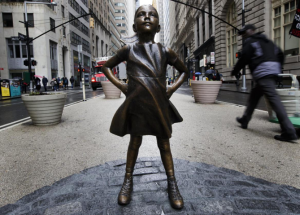 I saw that the Charging Bull sculpture near Wall Street has a new “companion” sculpture called “Fearless Girl”, and that the artist who created the bull is none-too-happy about it. He says that the new sculpture changes the meaning of his sculpture from what he intended: “the strength and power of the American people” to something else, entirely…a symbol of patriarchal oppression. Can the guy who created the bull get rid of the little girl? What’s up? Back in 1987 there was a global stock market crash. 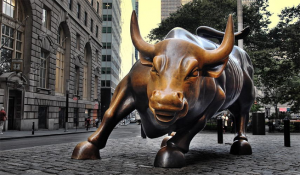 … Arturo Di Modica, a Sicilian immigrant who became a naturalized citizen of the U.S., responded by creating Charging Bull – a bronze sculpture of a…well, a charging bull. It took him two years to make it. The thing weighs more than 7000 pounds, and cost Di Modica some US$350,000 of his own money. He said he wanted the bull to represent “the strength and power of the American people”. He had it trucked into the Financial District and set it up, completely without permission. It’s maybe the only significant work of guerrilla capitalist art in existence. People loved it. The a**holes who ran the New York Stock Exchange, for some reason, didn’t. They called the police, and pretty soon the statue was removed and impounded. A fuss was raised, the city agreed to temporarily install it, and the public was pleased. It’s been almost thirty years, and Charging Bull is still owned by Di Modica, still on temporary loan to the city, still one of the most recognizable symbols of New York City. 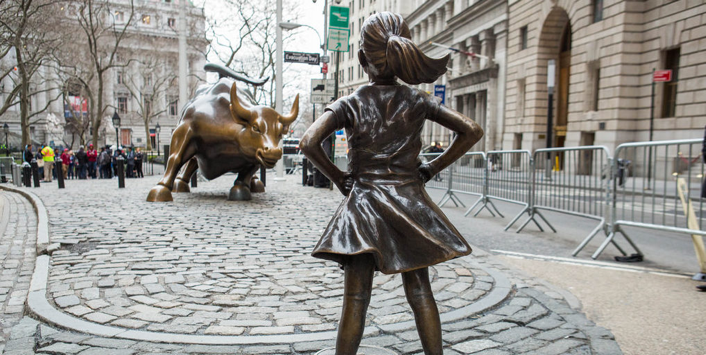 Then, on March 7, 2017, the day before International Women’s Day, Fearless Girl appeared, standing in front of Charging Bull. So what’s going to happen? 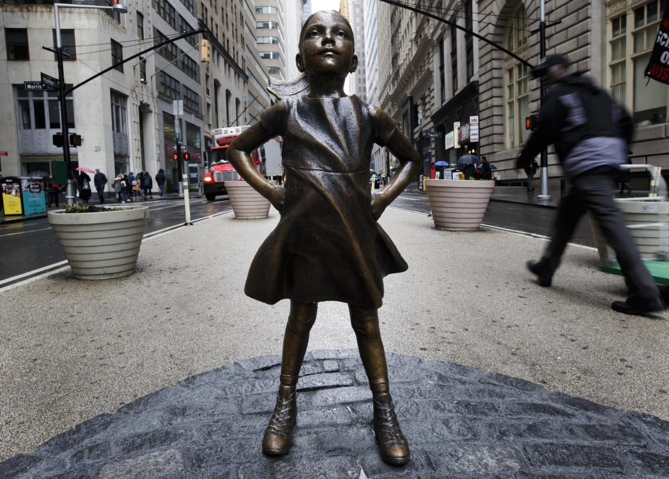 Has Fearless Girl in some way infringed on the artistic rights embodied in Charging Bull? Do artists have the right to control the context in which their works are displayed? 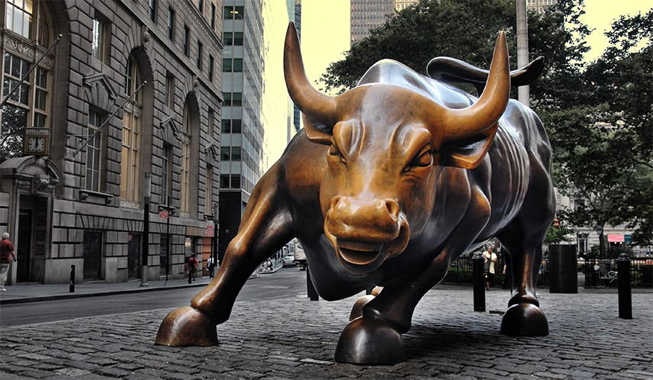 Would Charging Bull have the same meaning if it were displayed in the middle of a Texas prairie? In the middle of Tiananmen Square? Is it okay to hang a Picasso next to your kid’s crayon drawing on your refrigerator? The Doc thinks that there is a compromise here. 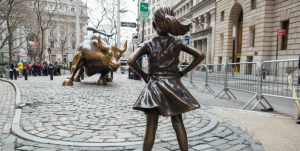 They should just turn Fearless Girl around so that she has her back to Charging Bull. Now THAT’s fearless! Have an intellectual property question that’s been nagging at you? Ask the attorneys at LW&H. They seem never to be able to get enough of this stuff.